When I was a kid, I never sat around dreaming of one day being a writer. Playing quarterback for the Denver Broncos, yes, but not stringing together sentences and paragraphs in some kind of effort to tell stories. As a young reporter at The Fort Morgan Times in 1987, I interview Colorado Gov. Roy Romer. And then something funny happened on the way to stardom in the NFL. I stood in a gymnasium full of frenetic sophomores in August 1979, desperately trying to complete my first high school schedule. I had one blank spot — and one class available to me. Journalism. I’d always read the newspaper — I’d even launched a neighborhood newspaper in elementary school that, sadly, folded after it’s first edition. I’d even been a Denver Post paperboy for a while, but I’d never actually thought about working for a newspaper. In the months ahead, something clicked. I loved the fact that you started with an idea, and headed out to find the facts to tell a story, and then pulled it all together on deadline. I loved it when our class took a tour of the old, cluttered Rocky Mountain News, and I loved the cacophony of sound in the newsroom — typewriters banging, a police scanner crackling, a ticker-tape machine firing with the rhythm of a machine gun. I came back the next year and signed up for the newspaper staff, and my senior year I was named editor-in-chief. I had no idea what I was doing, but for the first time I felt I could see my future. And then I hit the lottery. I picked up a class catalog for Metropolitan State College and signed up for three journalism classes my first semester. And all three were taught by Greg Pearson, a former Marine turned newspaperman turned college professor whose booming voice shook the walls and who bristled with a deep love of the written word. He believed in me before I believed in myself, a magical moment for an introverted kid trying to find himself. I worked on the college paper — serving as editor my junior year — and wrote for a weekly and spent a summer in New Mexico at the Las Vegas Daily Optic, where I worked as a fill-in reporter for minimum wage and had the time of my life. After graduation, I did what budding journalists did in those days, papering editors’ desks all over Colorado with my resume and some of my best clips, and it worked. Bill Spencer hired me at the Fort Morgan Times, and I sat down to a Royal manual typewriter in February 1987 and started work as an honest-to-goodness newspaper writer. I learned so much in those early years, and eventually I knew I needed to move on to new challenges. I spent a little more than eight mostly enjoyable years a the Fort Collins Coloradoan, and then, in 1997, was offered a job by the Rocky Mountain News as a cops reporter. I ultimately spent more than 11 years at the Rocky, and I thought I might spend the rest of my career there. But it wasn’t to be. On Feb. 27, 2009, it became another victim in the seismic shifts rattling the newspaper industry. Shortly before the first World Series game in Colorado Rockies history, I stand on the field at Fenway Park, trying to get into my notebook what it all looked and felt like. I was lucky, though, that Denver Post editor Greg Moore offered me a job, and I was able to continue my journalism career in the city I love. In junior high, I was tossing The Post from the handlebars of a bicycle, and from 2009 through 2012 I made my home in the Post’s newsroom, working on interesting stories on just about anything you could think of. I spent some time helping a small non-profit investigative news project take the next step, and in 2013 I joined FOX Sports 1 as a national investigative reporter. Here I am, closer to the end of my career than the beginning, learning about the television side of the business. People ask me what I like the most about my job. The answer is simple: Everything. Every day is different. I get to meet and talk with all kinds of interesting people. I get to see the worst in people at times — which isn’t fun — but I also get to see the best in people, and sometimes the best in people in the worst situations. I get to travel a little bit. And I get a front-row seat to history. Over the years, I have been honored numerous times for my work, and in 2008 I was nominated as a finalist for the Pulitzer Prize in Feature Writing. Those awards are all nice, but none of them means more than those given to me by my colleagues at The Rocky , who voted me “Best Reporter” three times (2001, 2004, and 2005) and “Best Writer” once (2008). What else can I tell you about myself? I’m a rabid — as in, foaming at the mouth and in need of shots — Denver Broncos fan who has been known to watch videotapes of the team’s two Super Bowl victories on a regular basis, just to remind myself that it really happened. I love the Colorado mountains and spend as much time as possible in them. As a child, I once called my mother at work to report that I’d cut my mouth on a Dorito. I’m restoring my first car, a 1967 Plymouth Barracuda fastback that I expect, at my current rate of progress, to finish in approximately 2029, give or take. 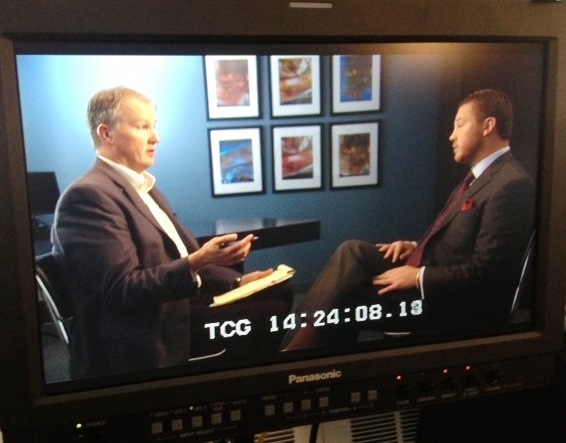 Interviewing Chicago attorney Joe Siprut for a piece on concussions in college sports. And I couldn’t do any of it without my incredible wife, who is earning a one-way non-transferable ticket to heaven every day teaching elementary school, and our three unbelievable kids, who have given me a few gray hairs (but not too many), taught me more about love and life than I ever could have imagined, and made me one proud pop. "The Ledge: An Inspirational Story of Friendship and Survival" -- winner of the National Outdoor Book Award -- is available now at fine booksellers everywhere. Interested in purchasing a copy? Click on the cover of the book above. "The Ledge: An Adventure Story of Friendship and Survival on Mount Rainier" by Jim Davidson and Kevin Vaughan, can still be found in hardback on the used-book market. Click on the picture for more information about buying the hardback -- and check the Events page for details on upcoming scheduled appearances by Jim and Kevin. "... Their slow-the-clock, second-by-second, ticktock approach to a fall into a crevasse on Mount Rainier in 1992 is seductive — and instructive." "The Ledge is a well-written and at-times gripping tale. Although you know the outcome from the beginning, Davidson keeps you engaged by telling each climber's story and tying those threads together at the time of the accident." "... A riveting account of the mental and physical strength Davidson coaxed from characteristics honed since his childhood to escape the cevasse."